In but a few short years, 19-year-old Dutch producer and DJ Oliver Heldens has managed to amass the kind of following many established acts can aspire to, thanks to his knack for balancing his love of deep house with more popular fare. After releasing a string of singles, EPs and a healthy dose of remixes, Heldens is about to unleash his new collaborative single, "You Know," with Zeds Dead, arguably his biggest release to date. But what do his 108,000 Twitter followers and near 460,000 Facebook likes translate to in terms of drawing crowds in sub-zero Montreal weather? Well probably not the numbers he brings in traditional club settings, but a non-negligible crowd nonetheless. When introducing Heldens during his BBC Radio 1 Essential Mix last December, Pete Tong called him "one of the breakthrough producers of 2014, who delivered a whole new main stage sound," which is both somewhat true and also a bit of an overstatement. What Heldens does best is drop crowd-pleasing club hits repeatedly, giving the people what they want. 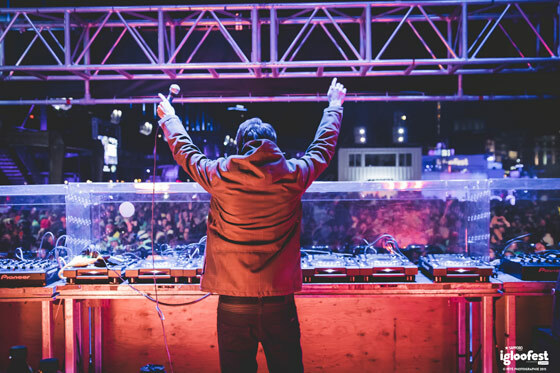 While not particularly inventive, his set was filled to the brim with basically every major nightlife hit and remix released in the last year, including tracks by Calvin Harris, Steve Aoki, Avicii and Martin Garrix, much to the crowd's delight. Add the inescapable Drop Dovers' remix of Tove Lo's "Habits (Stay High)" and an obligatory dubstep breakdown and you pretty much get the gist of the type of ambience Heldens created. This may not have been a night for the more discerning house aficionados, but it was definitely a satisfying set for those looking for an alternative to the typical club setting, but with exactly the same music.